The layout of the Nation’s Capital is a huge plus for DC wedding photographers. Thanks to the Height of Buildings Act, Washington’s skyline is purposefully short. That piece of municipal legislation caps the height of DC’s edifices to 130 feet. And that is great for a Washington, DC, wedding photographer. The idea behind Washington’s law is to keep residential and commercial architecture from blocking views of DC’s most famous structures. Visitors to DC thus have clear views of iconic buildings like the Basilica of the National Shrine of the Immaculate Conception. The entire National Mall area is open and obstructed, meaning the Washington Monument can even be seen from nearby Arlington, Virginia. Shorter structures like the Lincoln and Jefferson Memorials are also clearly visible from across the Potomac River. That visibility is what makes the city’s architectural policy so ideal for a Washington, DC, wedding photographer. The prominence of the monuments and memorials makes it easy to get memorable portraiture almost anywhere in the Nation’s Capital. That means newlyweds do not have to stand near the Washington Monument for it to appear in their couples portraits. The same is true for the US Capitol. The fourth-tallest building in Washington, the Capitol Building rises 289 feet over the east end of the National Mall. It is clearly visible from many of DC’s north-south streets, particularly those in the city’s northeast quadrant. The best view, unsurprisingly, is probably from Capitol Street. That boulevard runs north from the US Capitol and marks the boundary between Washington’s east and west sides. It actually also passes by the aforementioned Basilica of the National Shrine of the Immaculate Conception. On its way south from the Capitol, it runs close to the Washington Nationals baseball park. 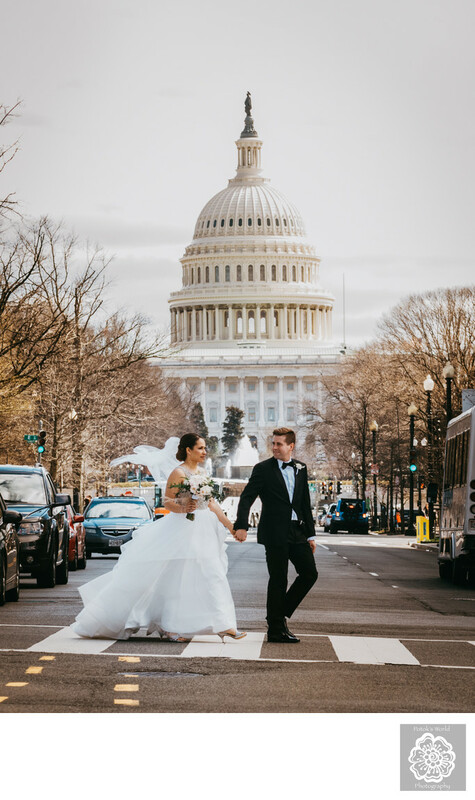 The wedding plans of this DC bride and groom set them up perfectly for unforgettable pictures featuring the US Capitol. They got ready for their nuptials at the Phoenix Park Hotel, a lovely wedding venue in a historic Washington building. It also just happens to be located on North Capitol Street and F Street Northwest. That particular DC intersection is just a few blocks from the Capitol and offers a magnificent view of the edifice. After this Washington couple finished getting into their wedding clothes, they had a quick first look in the hotel lobby. We then took them and their wedding party across Massachusetts Avenue Northwest to the historic Postal Square Building. Now the National Postal Museum, that DC edifice has a beautiful exterior staircase that is perfect for family formal photos. Once we took pictures of the fiancés with their families and friends, we sent the relatives on to the ceremony. The spouses-to-be stayed behind for an extended couples portraits session around downtown Washington, DC. We took them on a tour of the Nation’s Capital, stopping at several of the city’s famous landmarks. As we mentioned above, we were already near the US Capitol, so that seemed a perfect place to start. And an ideal location for an iconic piece of Washington wedding photography! We captured several beautiful images of the future spouses posing in front of the Capitol’s iconic rotunda. The best shot, though, happened almost by accident. The couple crossed back over North Capitol Street on their way back to the Phoenix Park Hotel and their car. On the way, the husband-to-be looked back at his bride and took her hand in his. It was such a sweet and spontaneous moment, and we felt lucky to have gotten it on film. After getting that shot, we took the bride and groom to the Jefferson Memorial for some additional portraiture. Located next to the calm waters of the Tidal Basin, the structure is an iconic part of DC’s skyline. It is also a great spot for romantic and beautiful pictures of newlyweds. 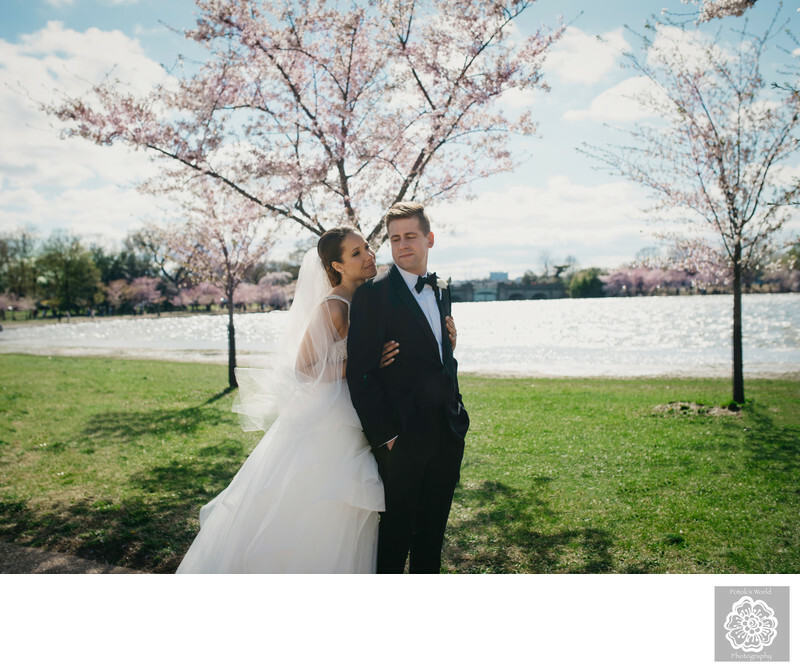 The Jefferson Memorial is a particularly ideal spot in the spring — when this couple tied the knot. That is because the cherry blossom trees that ring the Tidal Basin are in bloom at that time. The delicate white and pink flowers provide a beautiful backdrop for engagement photos and wedding pictures. We took some lovely portraits of these spouses-to-be posing amid the cherry blossoms. Then we headed with them to their wedding ceremony and reception at 101 Constitution back near the US Capitol. Location: United States Capitol, East Capitol St NE & First St SE, Washington, DC 20004 . Keywords: DC wedding photographer (18), DC wedding photographers (48), DC Wedding Photography (9), Washington DC (3).